Take a good look at the photo below. It’s obviously a picture of a race track. Do you recognize it? The lush green hills might suggest that it’s a track in England, but it certainly doesn’t look like Silverstone or Brands Hatch. It’s not heavily wooded like Road America and there is no large body of water that close to Barber Motorsports Park. One thing is certain – it appears to be a very scenic venue. I sent the photo to my oldest brother, who has forgotten more about racing than I’ll ever know. He couldn’t identify it either. Give up? It’s Sonoma Raceway. I don’t know who took it originally, but it made its way through social media a couple of weeks ago. 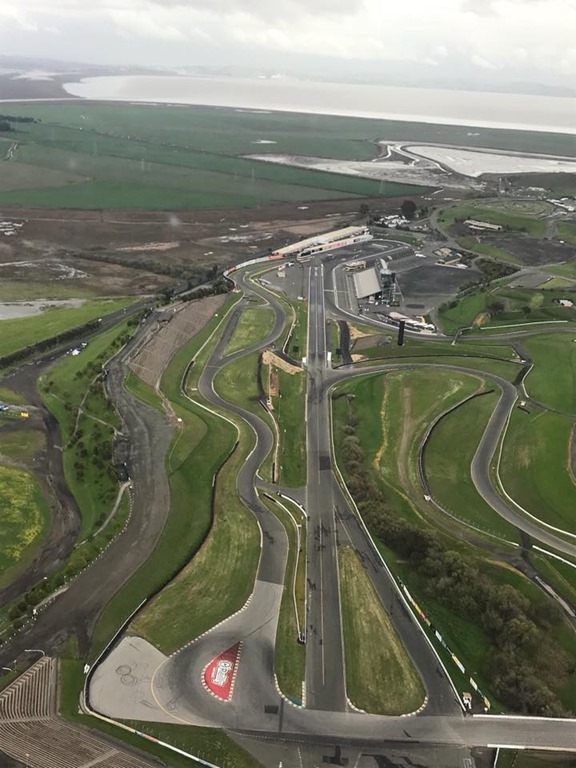 This is what Sonoma Raceway looks like at this time of year. It’s a far cry from the dust bowl conditions we see when the Verizon IndyCar Series conducts its season-finale in mid-September. When NASCAR makes its annual visit to the track in mid-June, it looks pretty much the same as it always does when IndyCar has staged races in either August or September since 2005. I’ve never hidden the fact that Sonoma is always one of my least favorite races. One big reason is because it looks so unappealing on television. Every year, without fail, TV announcers will tell us how gorgeous the scenery is there. I’ve never been there and people I know that have, concur with the announcers. But what we see on television looks like a parched wasteland. The dry brown grass does little to hold down the dust when a car drops an inadvertent wheel off the circuit. All you see is a brown cloud that hangs in the air for several seconds. I always get thirsty watching the race. Sonoma rarely produces great racing and fans have never warmed to the idea of IndyCar crowning its champion there. It is even more insulting that due to its place on the schedule, Sonoma is the only other race besides the Indianapolis 500 that awards double-points. I am completely opposed to the idea of double-points being assigned to any race, but Sonoma? Please. Two weeks ago, the Verizon IndyCar Series had a successful opening to its season at The Firestone Grand Prix of St. Petersburg. Fans talked about it for several days the following week. It will be another two weeks before the next race at Phoenix. That’s four weeks between your first and second race of the season. Whatever momentum and buzz was created by the opener in St. Petersburg, will be completely gone long before the series gets to Phoenix. IndyCar really needed a race slotted into this past weekend. It seems to be that yesterday would have been a great time to race at Sonoma. Of course, that’s assuming that an eighteenth race could be found – either to become the season finale or to be moved into a slot vacated by a present track becoming the site for the season-ending race. Based on comments I’ve seen here and other places over the years, I don’t think I’m the only one that finds the dry and dusty conditions at Sonoma in late summer to be objectionable. It wasn’t until about five or six years ago that I realized that Sonoma had a green season. It was during a pre-season IndyCar test at Sonoma and I happened to see some in-car video of the test. At first, I thought I was watching the wrong clip from somewhere else. For once, Sonoma really was beautiful. The lush green rolling hills looked like how I’ve always pictured Ireland to be like. Since then, I’ve always asked why IndyCar can’t move Sonoma to March. The reason I have been told more than once is that it’s the rainy season there. OK, so doesn’t Firestone provide rain tires at every non-oval race? Besides, just how wet is the rainy season at Sonoma? I did some checking on the climate at Sonoma comparing March to September and also comparing their March climate to that of Indianapolis in May (when rainy conditions really do matter). Just for kicks, let’s look at the temperature first. The average high temperature at Sonoma in March is 66°, as opposed to 86° in September (and 88° in August). The average high temperature at Indianapolis in May is 77°. March sounds a lot more pleasant than September for attending a race. More importantly, let’s compare rainfall between Sonoma in March and Indianapolis in May. Average rainfall in March at Sonoma is 4.05 inches. That’s slightly lower than Nashville’s average in March, which is 4.11 inches. What’s the average rainfall at Indianapolis in May? Try a whopping 5.05 inches. That’s 25% higher than what Sonoma gets in March, but IndyCar can’t race there because it’s the rainy season? It sounds like the “normal weather season” if you ask me. Some will argue that you can’t be in California in two consecutive months, since the series would be returning in less than a month for the Toyota Grand Prix of Long Beach. OK…I might buy that one. I understand the importance of date equity and commend this current administration for leaving dates alone unless completely necessary (i.e. moving Phoenix last year). But a tweak here and there may be beneficial in the long run. How about opening the season at the end of February or first of March at Sonoma? Boring tracks look a lot better to race-starved fans coming off of a long off-season than they do at the end of the season. The average high temperature in February only drops down to 63° in February. Does that put enough distance between Sonoma and Long Beach? They may be in the same state, but there is more than 425 miles separating the two. I’m not sure one would be stealing that many fans from the other. I think the real reason why we won’t ever see IndyCar race at a pretty green Sonoma Raceway is that sponsors like going to the finale in September at Sonoma. The proximity to San Francisco and being in the center of wine country holds quite a lot of appeal. Heck, Susan and I are talking about possibly going this year just to check it out. I haven’t been to San Francisco since I was twelve years-old and Susan has never been. Maybe if we go, I might see all of this beauty everyone keeps raving about that somehow eludes the TV screen. But from where I sit in my den every year when the finale at Sonoma comes up, I watch what amounts to a suspenseful parade in what looks like dry desert conditions. Now that we know that Sonoma has its pretty time of year, that makes it even tougher to watch in September. This entry was posted on March 26, 2018 at 4:03 am and is filed under IndyCar. You can follow any responses to this entry through the RSS 2.0 feed. You can leave a response, or trackback from your own site. The fact the race at Sonoma is on a boring road course is enough for me to pass on…. The fact that it’s brown that time of year doesn’t bother me but I wish it were not the season finale. I’d prefer it anywhere other than the finale. Hopefully the new bodykit can liven the race up a bit. I’d like to see this “race” go away, but if we have to keep it, March would be better than late summer. Two consecutive races in California is no problem. People not from Texas or the Western US forget how huge the state is. It’s a six hour drive between Sonoma and Long Beach. I’ve long thought that the series should double dip NoCal. Once in the spring and once in the late summer/fall. Once Laguna and once Sonoma. Which one comes first? I don’t mind. One will be green and once will be dry, either way you are putting the series in the den of potential tech sponsors twice a year. The tracks are far enough away on the map and would be on the schedule to keep both happy. IndyCar has moved so many dates of sometimes long-standing events to different months only for them to disappear from the schedule not soon after the new date proved to be unsuccessful. The series is probably better off not trying this again, no matter if we like Sonoma in the fall or not. Mexico City would be a good fit for the open slot in the schedule in Mid-March because the weather is certainly more likely to be favorable than racetracks in North America outside of Florida. I guess even Houston in March would be damp. How about Barber in late March, and Sonoma in late April? It would reduce travel. I remember one year at Barber when the race weekend started in March and the race was on Apr 1 (like this year’s calendar). It was cold, the grass was still brown and their signature dogwoods and azaleas has not bloomed yet. Late April is much better for Barber. I was there at the test on Feb 5 and while the morning’s were cool and dewy, by 9 or 10 am I could take my sweater off, because it was warm enough. But I’m from Utah where 50 degree weather is t-shirt weather. Also, I suppose sponsors and fans who attend the race in September, like the fact that the vines have grapes and are full and lush, whereas in March, the vines are pretty much bare. Harvest time is September/October. That said, I’m sure wineries, restaurants and accommodations wouldn’t mind an influx of customers during the slow season. And the traffic going in and out of Sonoma Raceway is kind of a terror, even during the slow season. I’m afraid to think how it would be during Sonoma’s peak season!